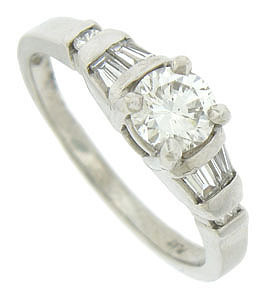 This distinctive platinum engagement ring is set with an EGL certified, .62 carat, E color, Vs2 clarity round cut diamond. The fiery diamond sparkles from the a spectacular mounting set with tapered baquettes and additional round faceted diamonds. 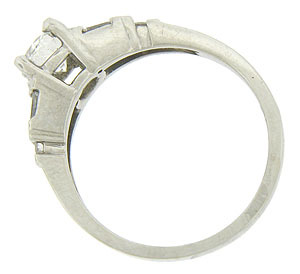 This exceptional antique style wedding ring measures 5.45 mm in width. Size 6 3/4. We can re-size.